Are you an avid cyclist, and prefer to get your exercise routine done at night simply because there is far less traffic than the mad morning hour rush, and the weather is also a whole lot cooler? Well, that’s fine with me, but I need not warn you that the dangers of night cycling increases by a whole lot. I don’t have the statistic to back me up, but obviously visibility is reduced, and more people tend to knock back a tipple (or more) then, hence decreasing their ability to be alert behind the wheel – which does not translate to a very favorable environment for cyclists. 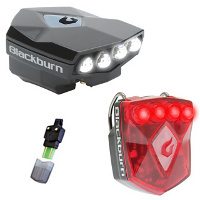 You might want to do your bit to maximize your chances of being spotted, so apart from wearing a fluorescent yellow jacket increases your visibility, how about the £44.99 Blackburn Flea 2.0 USB Lights Combo? This unique device might be tiny just like their namesake, but is virtually impossible to ignore. Each of these front and rear lights will feature a quartet of built-in super bright Nichia LEDs that can produce up to 40 lumens of brightness. You will be able to set them to glow at all times, or flash to attract more attention. They’re powered by built-in li-ion batteries, and you can recharge them by plugging it into a USB port. t’Light S – let there be light, and music! So the front strap is too large to wraparound normal handlebars (road drop bars). I find this completely a fail on their part. I read other reviews on the web that people had the same problem, even resorting to fashioning a clip or strap themselves to make the front light fit. Both little Velcro straps are the same length. The rear is OK as you can put it around the seat tube or a loop in your saddle bag. But on the front the strap wraps too far around so that the velcro plastic weave doesn’t meet up with the fuzzy side to adhere. It will barely meet up then run into the light and is inevitably loose and falls down or off! I guess I will have to figure something out or put it on the headset sidways which will look really stupid and not what I want. I called Blackburn (Flea) up today and decided to ask if they had a solution or smaller straps as their product is proprietary to these straps and has no clip on like most EVERYONE else. I talked with “Kia” and she informed me that they never EVER had any such calls about this. I continued to ask politely about what I could do so that I could use their product and again she was just adiment about how she never heard of this. I informed her I read a few reviews that ppl had the same problem. She again offered no help and even was condescending about it. Basically I was treated as crazy and there was no issue. I found this just horrible customer service. Apparently there are 7 ppl that work there and no one (she says) has heard of it and if there was a problem they would have gotten a call. Well I guess I was the only one to call and ask – terrible me! She said to tell ppl to call them about it – OK everyone call them..ya right! I say just buy something else – unless you want to lose your headlight or plan a DIY adventure to get the thing to stay on and remove easily for charging. It doesn’t seem like this company even designed the product the way she acted so who knows. All I know is it is a major fail and I’m not even asking for a snap on ring – but would be nice…I’m just asking for a 2 cent strap that fits a drop handlebar with Velcro on one side and rubber on the other and is super thin that I’m sure I can never find. 🙁 This wouldn’t be a big deal if it was permanently attached but you have to take it off to charge it every time so it is. It’s pretty much to long a fot to put around my tape on bars too. Geez what are they thinking!? Ok….so also the lights don’t seem to last a jaunt around town at night. I’m going to cycle the batteries a bit and see. I do not recommend these but I’m keeping mine (returning a $55 used LBS item is a pain).